Please join us Wednesday evening, March 25 for a cocktail reception at the hotel from 7-9:00 pm. The symposium will kick off at 8:00 am Thursday and is scheduled to go until 5:00 pm. A light continental breakfast will begin at 7:30 am. Rockwell Collins has made arrangements with the hotel that includes reduced rates for your accommodations. Please make your arrangements using the link below to ensure you are part of our room block at a rate of $139 a night. Space is limited, so please register for the event by March 13, 2015. If you have any questions, please contact Mitch Bernstein atmitch.bernstein@rockwellcollins.com or 973-294-9751, or your local Rockwell Collins representative. If you are not the intended recipient or have received this email in error, please delete immediately. Any dissemination, distribution or copying of this message by any person other than the intended recipient is strictly prohibited. 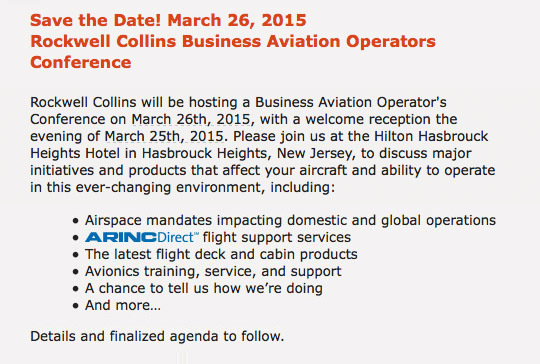 © 2015 Rockwell Collins. All rights reserved.